“From Doubt to Astonishment” is how Galileo described the discoveries he made about the Earth and heavens. They proved to be earth-shaking. When Galileo Galileo published his book Sidereus Nuncius, or The Starry Messenger, in 1610, he was at first praised but then promptly vilified for going against the accepted wisdom of the day. In this small book that would prove to have huge consequences, Galileo demonstrated that the Earth was indeed in motion, and therefore was not the center of the universe. 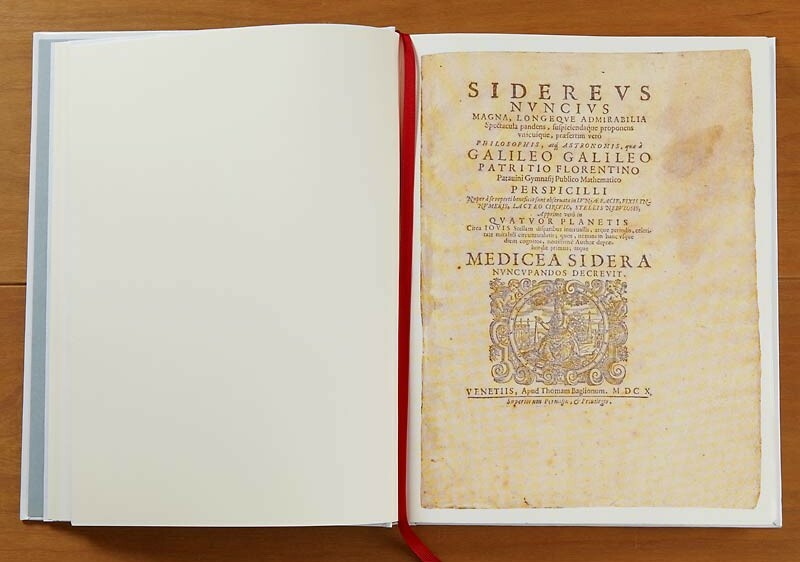 Most copies of Galileo’s Sidereus Nuncius were thoughtlessly trimmed by book binders who wanted the little book to conform to their bindings. The Library of Congress, however, owns one of the few intact, untrimmed copies. 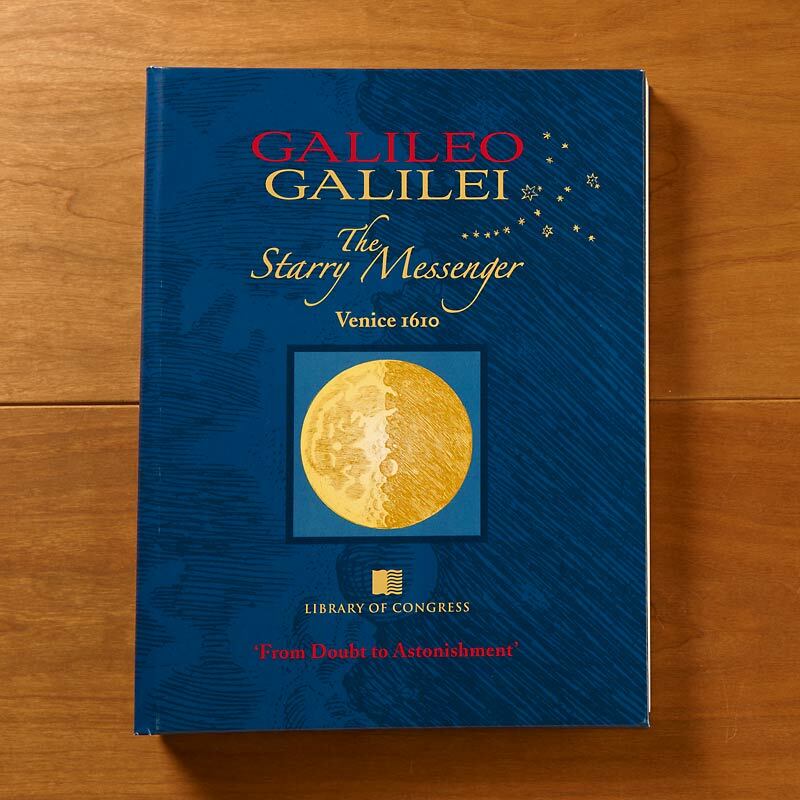 The Library of Congress’s book has been reproduced in a facsimile edition published by Levenger Press that also contains an authoritative translation, by Albert Van Helden, plus essays on various aspects of The Starry Messenger by six Galileo scholars: David Marshall Miller, Owen Gingerich, Paul Needham, Eileen Reeves, Peter Machamer and John W. Hessler. The six had convened in November 2010 for a Library of Congress symposium held on the 400th anniversary of the publication of The Starry Messenger. Miller is Assistant Professor of Philosophy at Iowa State University. Gingerich is Professor Emeritus of Astronomy and History of Science at the Harvard-Smithsonian Center for Astrophysics in Cambridge. Needham is Scheide Librarian at Princeton University. Reeves is Professor of Comparative Literature at Princeton University. Machamer is Professor of History and Philosophy of Science at the University of Pittsburgh. Hessler is Curator of the Jay I. Kislak Collection for the History of the Early Americas at the Library of Congress and Lecturer in the History of Early Modern Science in the School for Advanced Studies at Johns Hopkins University. Hessler is also co-editor of the book with Daniel De Simone, who was Curator of the Lessing J. Rosenwald Collection of the Library of Congress at the time of publication and is now Eric Weinmann Librarian at the Folger Shakespeare Library.